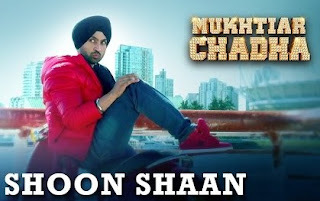 Read Shoon Shaan Song Lyrics and Watch Official Shoon Shaan Video song from Punjabi comedy film "Mukhtiar Chadha", Video song featuring Diljit Dosanjh. The song is sung by Diljit where as music composed by JSL Singh. The song lyrics penned by Ikka. Every man has a spectacular vehicle that leads him to glory. Even Mukhtiar Paaji has that. He's riding his scooter like a Hayabusa in the song "Shoon-Shaan". Angreji mein Letter likhwata tha aa.. Par meeting hona paati, Uska tha reason..
Uski class ki ladki, Friend bana lee..
Baat ye uske kaan mein daali..
Uske through tere ghar ka, Pata lagaya maine..
Main Shoon Shaan, Shoon Shaan Karke..
Naam kama ke betha hain..
Main na tere piche aata aa..
=> Also Check another Diljit Dosanjh Song - Sardaar Ji Title Song!